Team Russia forward Alexander Ovechkin in action during the IIHF World Championship pre-tournament game between Russia and Czech Republic at the Yubileiny Palace in St. Petersburg. Team Russia are among the favorites at the tournament, which begins on Sept. 17 in Toronto. 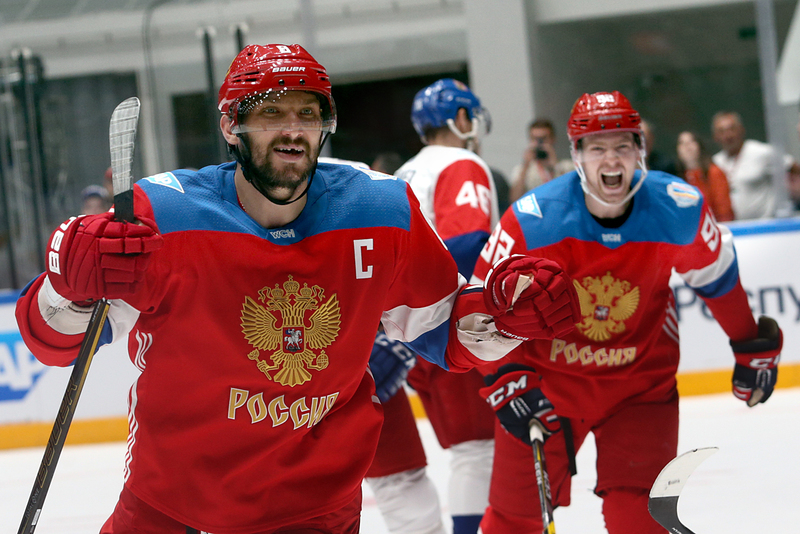 Bookmakers have placed Team Russia, a somewhat less striking successor of the profoundly feared Soviet “Red Army,” among the favorites at the 2016 World Cup of Hockey despite the team’s underperformance during the 2016 World Championship in Russia. The two-week international championship, organized under the auspices of the National Hockey League and featuring some of the best NHL players, is scheduled to start on Sept. 17 in Toronto, Canada. Eight teams will play preliminaries, semifinals, and ultimately the finals, from Sept. 27 to Oct. 1. In the preliminary rounds, Team Russia, led by three-time KHL “coach of the year” Oleg Znarok, will share Group B with Finland, to whom the Red Machine lost 3:1 in the semifinals of the 2016 World Championship in Russia, as well as Team Sweden and Team North America. Most of the players Team Russia have brought to Toronto come from the NHL – a decision dictated by the tournament’s specifics and a desire to test combinations of NHL players in anticipation of the 2018 Winter Olympic Games in South Korea, according to the Russian Ice Hockey Federation president Vladislav Tretyak. “The majority of players in this team compete in the NHL, and as a result, they know what to expect from the rink sizes. Before the Olympics, we can try out three NHL lines,” said Tretyak on the official Russia Hockey Federation website. Team Russia, with the age of the players averaging (in Russian) 27, has prepared a traditionally strong attack line featuring, among others, forwards Artem Anisimov and Artemi Panarin of Chicago Blackhawks, Pavel Datsyuk of Detroit Red Wings, Nikita Kucherov of Tampa Bay Lightning, Nikolai Kulyomin of New York Islanders, Alexander Ovechkin of Washington Capitals, Evgeny Malkin of Pittsburgh Penguins, and Vladimir Tarasenko of St. Louis Blues. Retired Russian hockey star Pavel Bure predicted a better spectacle than during the Olympics, amid concerns that Russia may consider the Cup as merely a passage to the Winter Olympics in South Korea. “The World Cup has a very interesting format. There won’t be any weak teams, which often happens at the Olympics and world championships, where outsiders come with the sole purpose of remaining in the group of the strongest,” Bure told (in Russian) the official World Cup website. Team USA and Team Europe will open the tournament on Sept. 17. Russia will play its first game in the tournament against Sweden on Sept. 18. All games will be played at the Air Canada Center in Toronto, Canada.